The combination of orange, fennel and garlic has become one of my favourites in dry curing pork loins (lonzino), so I decided to make a salami with the same flavour panel. 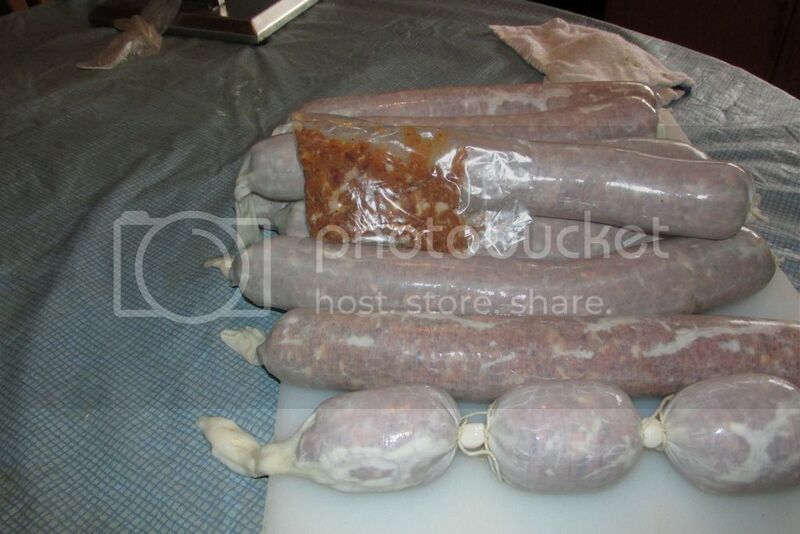 The sausage dried for 7 weeks, with a weight loss of 38%. The orange and fennel come through beautifully and complement each other very well, and the aroma is simply divine! It should be bottled and sold as an air freshener! I also used fennel pollen for the first time in this recipe, so maybe that is why the taste is so good. The other spices did not detract from or interfere the fennel, orange or garlic. Colour not the best but I suspect the orange zest is responsible for giving it that brownish hue. Also a bit of dry rim, since the salami was left unattended for a little over three weeks, but two or three weeks vac-packed and in the fridge will fix that. Like with all the salami I make these days, I made a couple smaller salami using the Umai tubes. They were ready in 4 weeks. Compared to the chamber cured sausage, they were a little sharper in taste with a hint of tang. But even so they tasted quite good. So if you want a salami that's more than salt and pepper and one that everyone will like, this is it! So start zesting your oranges! 1. Cut lean meat into 3-4cm. cubes, and back fat into slightly smaller ones. 2. Add the salt, #2 and cure to the meat and fat and rest in fridge for 48 hours. 4. Add the rest of the ingredients to the ground meat and mix thoroughly. 6. Ferment at 20-22C and 90+ RH until pH reads 5.3 or lower, but ideally not below 5. 8. Surface starter optional but recommended. Gees if you got some orange colored mold to grow on that you would really have a unique product! Why dried orange zest over fresh .......?? It's what I had on hand, and I would need to zest probably 20 oranges to get the amount that I put into this batch. Nothing wrong with dehydrated orange zest might even be better, just like porcini. I now zest and dry all of the oranges we buy, so over time it accumulates. In the past when I needed lemon peel and did not have it, I used a few drops of lemon extract. I think orange extract will work just as well. All you need is a few drops and it's cheap and effective. For 6 lbs of meat, what would the ratio be? I wanna do this recipe. It says per 1kg of meat. I have 6lbs 1/2 tsp per 1kg ? For 6 lbs of meat 1/2 tsp will work fine! So it would be 23 grams of salt x 3? I want to do this recipe with 6lbs of Duroc pork i just got ! Would pork loin work just as well as ham meat? I don't see why not, just make sure you add the back fat. I used pork loin in the batch I just made . I think orange extract will work just as well. All you need is a few drops and it's cheap and effective. I also used orange extract at the rate of 1ml per kilo. Wont have any results for another 2 months. 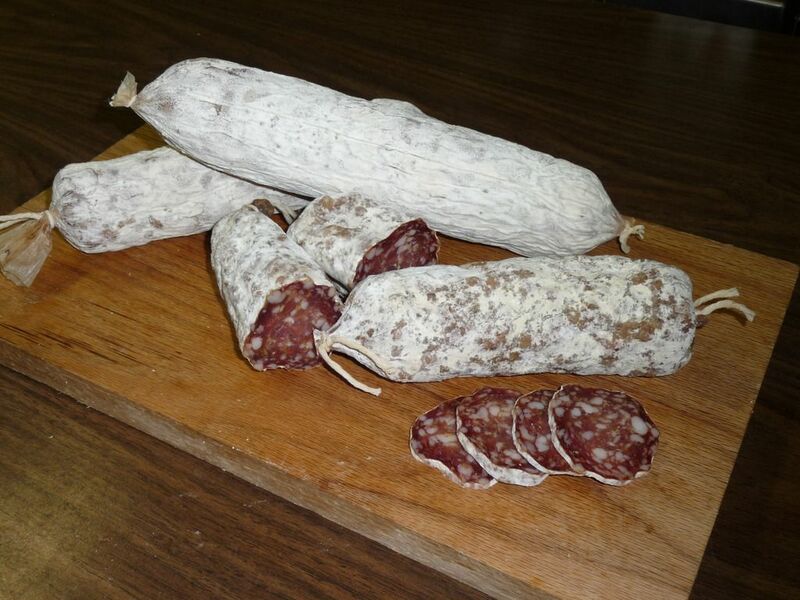 redzed wrote: The combination of orange, fennel and garlic has become one of my favourites in dry curing pork loins (lonzino), so I decided to make a salami with the same flavour panel. The sausage dried for 7 weeks, with a weight loss of 38%. The orange and fennel come through beautifully and complement each other very well, and the aroma is simply divine! It should be bottled and sold as an air freshener! I also used fennel pollen for the first time in this recipe, so maybe that is why the taste is so good. The other spices did not detract from or interfere the fennel, orange or garlic. Colour not the best but I suspect the orange zest is responsible for giving it that brownish hue. Also a bit of dry rim, since the salami was left unattended for a little over three weeks, but two or three weeks vac-packed and in the fridge will fix that. Like with all the salami I make these days, I made a couple smaller salami using the Umai tubes. They were ready in 4 weeks. Compared to the chamber cured sausage, they were a little sharper in taste with a hint of tang. But even so they tasted quite good. Saltedtyme30 wrote: I`m going to do this. May I ask why you ask for the cure # 2 and salt to the cubes meat and let rest rather than doing in one day ? I'm also interested in the answer to this. I started doing it this way a while ago - but more driven by logistics (do fresh sausage one day, dry cured another). I think that when I switched to pre-curing the pork it made the texture better, but I might be kidding myself. I guess curing the pork for a day or two makes sure the cure properly binds with the pork and isn't just mixed up with all the ingredients. Its an anti-oxidant which helps ensure the curing process works completely so there should be no nitrates/nitrites left in the sausage when the process is complete. Its not essential and there is some debate about its use. However the consensus seems to be adding it gives you some extra safety. You can use Sodium Ascorbate instead of Sodium erythorbate. You can also use Ascorbic acid - but be very careful if so - it can react with the cure chemicals in dangerous ways if not done correctly. A while ago I had some dry cured sausages lab tested for nitrates/nitrites. I found that they had zero when the product was ready - with or without an anti-oxidant. I`m going to do this. May I ask why you ask for the cure # 2 and salt to the cubes meat and let rest rather than doing in one day ? Its an old school method that may stem from using salt peter (nitrate) as a curing agent. Its to improve the flavor and color. In my opinion it also makes for a better texture as the meat is firmer and grinds more consistently. ↳ Smokehouses. Construction and Maintenance.